Hello everyone I’m getting ready to interview Domonic Asante from Angel of Death who may I say was a very handsome human and now that he’s a vampire he’s simply divine. It’s a perfect night to interview a vampire with the full moon outside. I’m sitting in a small dark room and growing impatient tapping my nails on the table just as I hear the door shut looking up I see Domonic seated across from me so suddenly that my heart skipped a beat and the most beautiful golden eyes staring at me and I felt all the tension drain from my body. Domonic: “Well if it was before I’d met Mika I’d have you in my bed by now.” He smiled slyly. Domonic: “Finding out the women I was in love with was originally hired to kill me before she fell in love with me and then decided to protect me putting us both in danger.” He shook his head as if he could make the memory go away. “For a brief moment I thought we’d all lose our lives.” His eyes looked haunted. Domonic: “I’d kill for less.” He smiled slyly flashing his sharp fangs at me. Leigh: Chills down my spine reminding me that he could be a deadly predator if he wanted to be despite how handsome he was. I swallowed both terrified and excited faced with the realization of the danger I could be in at any moment. I was left speechless. Domonic: “Of course I’d never hurt you sweetie.” He smiled his fangs no longer showing. Leigh: He reached out and touched my hand ever so softly his index finger stroking the palm of my hand sending tingling sensations up my arm down to the pit of my stomach. His eyes pierced right through mine drawing me in until I felt my will melting away. Leigh: “That sounds nice.” I answered my voice not quite sounding like my own. His body seemed to be drawing closer to her instead of backing away. She was more beautiful than he could have imagined. Her skin was so pale and flawless against her raven black hair that she seemed as if she didn't belong in this world. He stared into those emerald eyes that shimmed and glowed. Her eyes reminded him of something he just could not place his finger on. Her tongue traced her lips giving him the urge to trace those lips with his own tongue. He drug his eyes off her lips and back to those beautiful eyes and that's when it hit him. Her eyes reminded him of cat's eyes that glowed in the night. The he noticed that anger flashed in her eyes, the most deadly sort. But that was impossible; she was far too beautiful to be dangerous. I grew up loving to escape in the world of stories that my Father would write just for me. So it wasn't any wonder that as I got older I too picked up the pen and started writing. As a teenager I loved the stories with anything paranormal and I've tried to create my own world of vampire and other things that go bump in the night. I hope you enjoy reading this story as much as I enjoyed creating it. Give away time. There will be two giveaways so please read below. 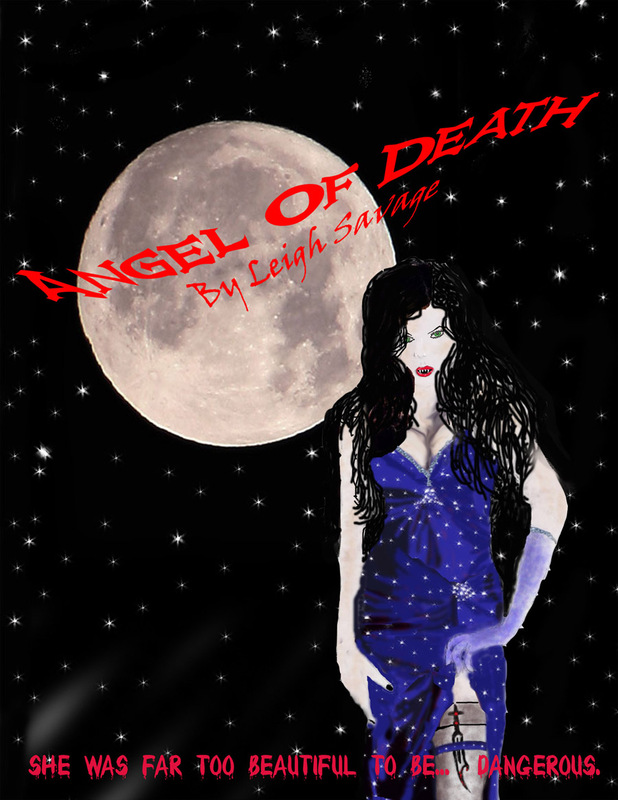 Leigh is giving away one autographed copy of Angel of Death and another person will win a kindle copy or a pdf copy of Angel of Death. To enter please leave a meaningful comment or ask a question. Your welcome Leigh! Thanks for participating! Great interview...how did you come up with this story idea? Pc I must admit the story didn't turn out anything like I originally planned on but it took on a life of it's own. Second place winner is Sheryl who wins a kindle or pdf copy of Angel of Death.